Shielded from the bustling Orchard Road by a sprawling green lung, the Istana (‘Palace’ in Malay) is the official residence of the President of the Republic of Singapore. On its well-manicured grounds stand the Main Building (commonly called the Istana), Sri Temasek, Istana Villa, and The Lodge. The former two buildings are particularly significant: not only have they been graced by numerous local and foreign dignitaries through the years, they have also witnessed milestones and important events in Singapore’s history. Together, they represent the sovereignty of Singapore as an independent state. 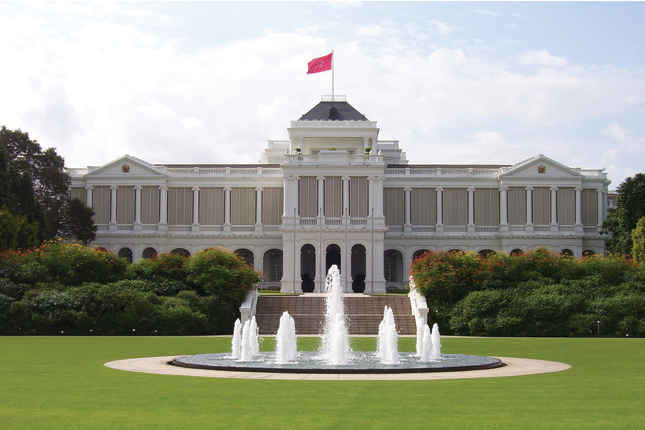 The Istana, originally known as Government House, was touted as ‘the finest building of its kind in the Far East’ in an 1890 guidebook to Singapore. Its construction was initiated by Sir Harry St George Ord, the first Governor of the Straits Settlements, who intended it to be the governor’s residence. The initial estimated construction cost was 100,000 Spanish dollars for labour, furnishings, and landscaping. Ord reassured the Legislative Council that extravagance and opulence would be avoided. As costs increased, Indian convict labour was brought in to cut spending. However, by the time the Government House was completed, the costs had mushroomed to more than 185,000 Spanish dollars – almost twice the original projected budget. During the Second Word War, the Japanese military seized control of the Istana. In 1943, the Japanese Supreme Commander Count Hisaichi Terauchi designated the magnificent residence to be the General Headquarters of the Southern Expeditionary Forces, relocating it from Vietnam to Singapore. Members of the domestic staff who had survived the bombings were brought back to the Istana to serve Terauchi, who reportedly treated them well. They were instructed to don their old uniforms and maintain the house as they had done before. Besides redecorating a few rooms in Japanese style and destroying items bearing the British crest, the Japanese left much of the Government House intact. The British regained the ownership of the Istana after the war and handed it over to Singapore’s first Yang di-Pertuan Negara (Head of State), Encik Yusof bin Ishak, in 1959, when Singapore attained full self-governance. The building was then renamed Istana Negara Singapura (‘Palace of the State of Singapore’ in Malay). Since Singapore’s independence in 1965, the Istana has been the official residence of the President of the Republic of Singapore. When the Istana underwent extensive renovations between 1996 and 1998, then President Ong Teng Cheong shifted temporarily to the Former Command House on Kheam Hock Road. Colonial Engineer Major John F. A. McNair, who also served as the Superintendent of Convicts, chose an eclectic style for the Main Building (Istana Negara Singapura), incorporating European and Malay elements in its architecture. Neo-Palladian influences are clearly evident in the building, in features such as Doric and Ionic pilasters and columns, architraves, cornices, and arches. At the same time, characteristics that are typical of Malay houses can also be seen: there are wide verandahs, large louvred windows, as well as dwarfed piers and arches that resemble stilts elevating the entire structure. These tropical adaptations provided the interior with the much needed ventilation in Singapore’s tropical heat and can also be found in the Former Parliament House. Taking on a symmetrical plan, the Main Building’s front façade is dominated by an imposing projected portico, which is in turn flanked by twin porticoes crowned with triangular pediments. The central tower stands out prominently from the rooftop. Marble used in the construction of the edifice was imported from Java. Inside the Main Building are stately halls that now function as venues for state ceremonies and receptions. Local officials are introduced to visiting heads of states and ministers in the Reception Hall; foreign guests are hosted in state banquets in the Banquet Hall; and official ceremonies, such as the swearing-in of ministers and national award investitures, are held in the State Room. Numerous state gifts, as well as art works by local and foreign artists, are displayed in these halls. 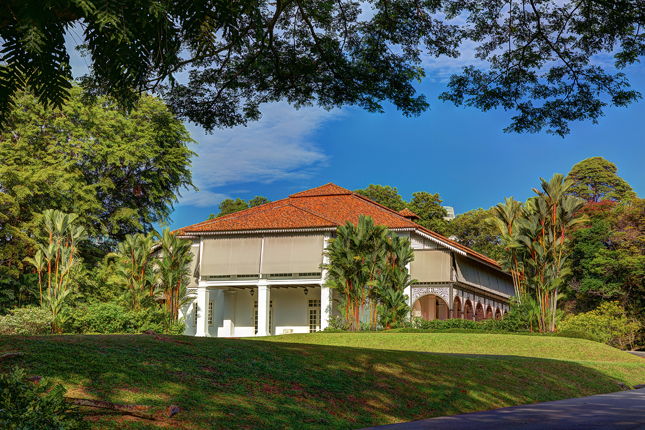 Sri Temasek is a double-storey bungalow that was once the colonial secretary’s residence; it was then designated as the official residence of the Prime Minister after Singapore gained independence. Its name recalls Singapore’s ancient name, Temasek, which means ‘sea town’ in Javanese. The architecture of Sri Temasek is a mix of both European and Indian elements. Some noteworthy features in the building include the delicate and ornate fretwork on the building’s timber arcade and the main stairway leading to the second storey. Like the Main Building, Sri Temasek also has spacious verandahs on the ground floor. 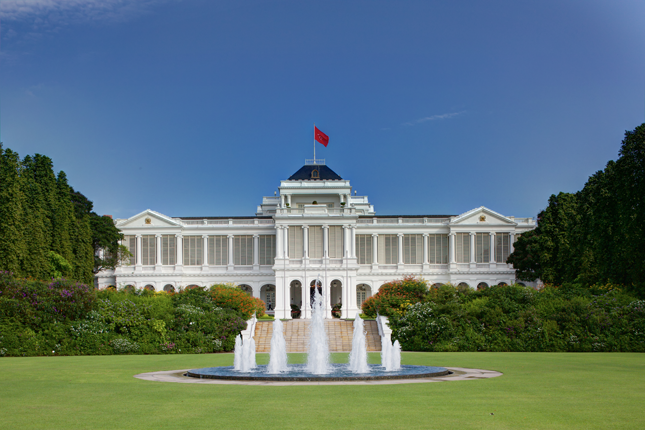 On certain holidays, the Istana grounds and the Main Building are open to the public. The Changing of the Guards ceremony is held at its main entrance on selected months. The Istana and Sri Temasek were gazetted collectively as a National Monument.